The Adventures of Rin Tin Tin TV show was a 30 minute action series on ABC about a young boy named Rusty and a German Shepherd puppy named Rin Tin Tin who were rescued by soldiers after an Indian attack on their wagon train. Everyone else was killed in the attack including Rusty's parents. The soldiers kept Rusty and Rin Tin Tin on at their fort where they helped the soldiers bring law and order to the old West. Title: "Rin Tin Tin Theme"
So brave is Corporal Rusty. Though he is just a boy. They are the army's ride and joy. Pals through thick and thin. Corporal Rusty and Private Rin Tin Tin. Although this series is commonly referred to as Rin Tin Tin, its full title was "The Adventures of Rin Tin Tin". Rin Tin Tin actually began on the big screen with a movie in 1922! Another series titled, "Circus Boy" was produced by Columbia Studios who also produced Rin Tin Tin. The shows were similar in that they both concentrated on a young boy and his pet who, against all odds, saved others from harm and generally helped people in significant ways. On Circus Boy, however, the pet was a baby elephant rather than a dog. Comparisons have also been made to "Lassie" for both aforementioned series. Rin Tin Tin was different from those other boy and pet shows in that there was much more violence including gunfights, Indian raids, etc. During the five seasons of Rin Tin Tin, five different dogs played the lead role. The original dog from the movies died in 1932 but two of the three dogs on the TV show were its offspring! Rusty lived with his soldier friends at Fort Apache in Arizona. ABC continued to broadcast Rin Tin Tin repeats in their after school time slot for two years after the new episodes ended. Then CBS ran them for another two years on Saturday mornings. Then, 12 years later, Rin Tin Tin was again seen in reruns. James Brown who played Lieutenant Rip Masters on the series had retired by then but still agreed to shoot new introduction for the reruns. 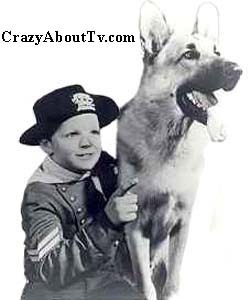 A new version of the show titled, "Rin Tin Tin K-9 Cop" aired on the Family Channel for 106 episodes from 1988-1993 becoming one of cable televisions first really successful shows. Thank you for visiting our The Adventures of Rin Tin Tin page!